Many of the nine advances in technology that form the foundation for Industry 4.0 are already used in manufacturing, but with Industry 4.0, they will transform production: isolated, optimized cells will come together as a fully integrated, automated, and optimized production flow, leading to greater efficiencies and changing traditional production relationships among suppliers, producers, and customers, as well as between human and machine. Industry 4.0 applications place the highest demands on shielding, electromechanical compatibility and reliability. Delikon heavy series over braided flexible conduit and fittings are specifically designed to protect power, control and instrumentation cable, the backbone of Industry 4.0. 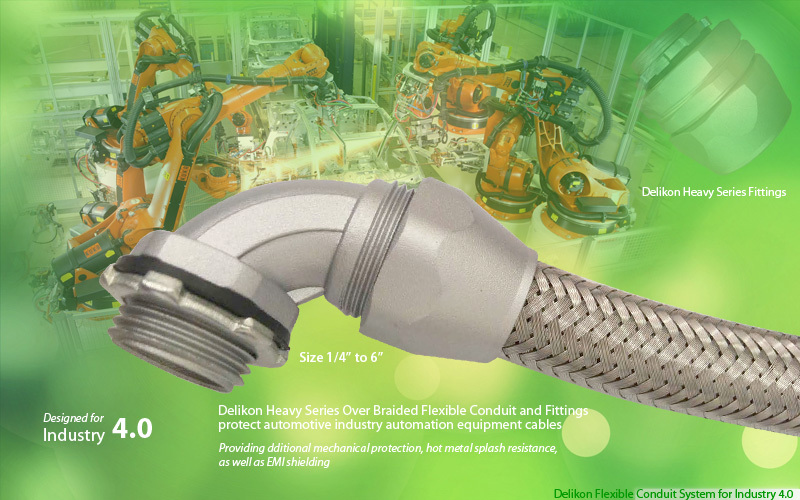 Delikon is the worlds leading provider of flexible conduit systems in the automotive industry. With years of experience, we are the master in the design of flexible and efficient cable protection for production process equipments cables. The automotive industry is very dynamic and requires extreme flexibility from automotive manufacturers. Delikon offers you the necessary configuration options to meet all the automotive challenges efficiently: through adaptable, modular and durable cable protection flexible conduit system, we pave the way to sustainable success in the automotive industry. Delikon heavy series flexible conduit and fittings series are ideal for catering to various requirements of the automotive industry. For example, the heavy series flexible conduit and fittings provide additional mechanical protection, hot metal splash resistance, as well as EMI shielding to automation control cables,arc welding line cables, and other automotive industry Automation electrical cables. The heavy series fittings have a metal clamping ring, providing positive clamping of both the braiding the conduit, as well as a termination for electromagnetic interference EMI shielding.